The best pizza comes from great ingredients and paying attention to details. Our pizzas are made from the finest ingredients possible, sourced from the best places that produce them – like real Wisconsin cheese. We separate ourselves from the ordinary by using our own unique spice blends and homemade sausage. Our core belief is simple: Source the best of everything and put a lot of it on each pie. Heggies has teamed up with Twin Cities chef Doug Flicker to create two new creatively authentic pizzas for our roster: El Jefe and Sloppy Joe. Spoiler alert: They are quite good. Nutritional Facts: LARGE: Serving Size 1/4 Pizza (142g) Servings Per Container 4. Calories 360. Calories from Fat 140. SMALL: Serving Size 1/3 Pizza (132g) Servings Per Container 3. Calories 340. Calories from Fat 140. Contains: Gluten, Soy, Dairy. The ultimate cheese-lover's pizza, topped with cheddar and mozzarella. Nutritional Facts: LARGE: Serving Size 1/5 Pizza (136g) Servings Per Container 5. Calories 350. Calories from Fat 170. SMALL: Serving Size 1/3 Pizza (149g) Servings Per Container 3. Calories 420. Calories from Fat 190. Contains: Gluten, Soy, Dairy, MSG. Made with sausage and mozzarella cheese. Nutritional Facts: LARGE: Serving Size 1/4 Pizza (149g) Servings Per Container 4. Calories 470. Calories from Fat 240. SMALL: Serving Size 1/3 Pizza (142g) Servings Per Container 3. Calories 370. Calories from Fat 180. Contains: Gluten, Soy, Dairy. Covered from edge to edge with pepperoni and mozzarella cheese. 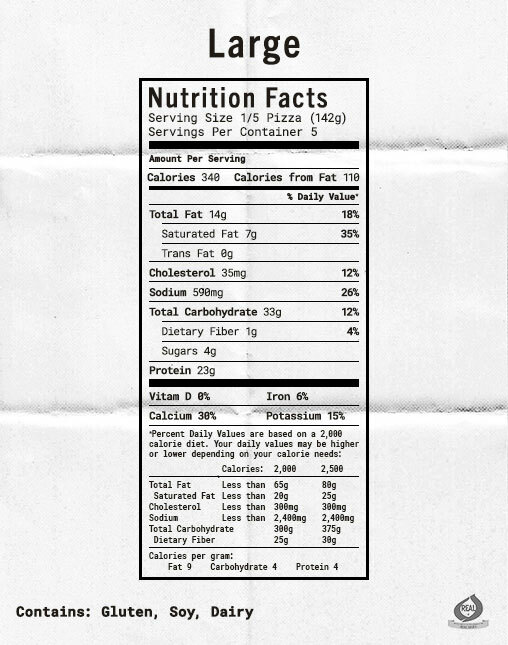 Nutritional Facts: LARGE: Serving Size 1/5 Pizza (147g) Servings Per Container 5. Calories 390. Calories from Fat 200. SMALL: Serving Size 1/4 Pizza (120g). Servings Per Container 4. Calories 380. Calories from Fat 200. Contains: Gluten, Soy, Dairy, MSG. Featuring sausage, pepperoni and mozzarella cheese. Nutritional Facts: LARGE: Serving Size 1/6 Pizza (132g) Servings Per Container 6. Calories 310. Calories from Fat 140. SMALL: Serving Size 1/4 Pizza (128g). Servings Per Container 4. Calories 310. Calories from Fat 140. Contains: Gluten, Soy, Dairy, MSG. Loaded up with sausage, mushrooms and mozzarella cheese. A combo of sausage, pepperoni, mozzarella and just enough jalapeños to keep things interesting. Nutritional Facts: LARGE: Serving Size 1/7 Pizza (130g) Servings Per Container 7. Calories 330. Calories from Fat 180. SMALL: Serving Size 1/4 Pizza (149g). Servings Per Container 4. Calories 380. Calories from Fat 210. Contains: Gluten, Soy, Dairy, MSG. Made with sausage, pepperoni, onions, mushrooms and the freshest sliced-and-diced green peppers. Topped with plenty of mozzarella cheese. Nutritional Facts: LARGE: Serving Size 1/6 Pizza (142g) Servings Per Container 6. Calories 420. Calories from Fat 230. SMALL: Serving Size 1/4 Pizza (135g). Servings Per Container 4. Calories 430. Calories from Fat 250. Contains: Gluten, Soy, Dairy, MSG. Made with 4 meats and 2 cheeses. Loaded with sausage, pepperoni, Canadian bacon, bacon, cheddar and mozzarella. Nutritional Facts: LARGE: Serving Size 1/6 Pizza (137g) Servings Per Container 6. Calories 320. Calories from Fat 110. Contains: Gluten, Soy, Dairy, MSG. Made with garlic chicken, creamy alfredo sauce and mozzarella cheese on a thick, seasoned, hand-stretched crust. Nutritional Facts: SMALL: Serving Size 1/6 Pizza (128g) Servings Per Container 6. Calories 370. Calories from Fat 200. Contains: Gluten, Soy, Dairy, Egg, MSG. Made with country sausage, bacon, scrambled eggs, green onions, cheddar, mozzarella and country gravy. Nutritional Facts: SMALL: Serving Size 1/4 Pizza (120g) Servings Per Container 4. Calories 330. Calories from Fat 150. Contains: Gluten, Soy, Dairy, MSG. A hearty pizza made with bacon, beef, cheddar and mozzarella. Nutritional Facts: LARGE: Serving Size 1/5 Pizza (136g) Servings Per Container 5. Calories 330. Calories from Fat 110. Contains: Gluten, Soy, Dairy. The boss of Mexican pizzas. Mozzarella and cheddar cheese, Mexican-spiced tomato sauce, chorizo, diced jalapenos, black olives, and green onions. Nutritional Facts: LARGE: Serving Size 1/5 Pizza (142g) Servings Per Container 5. Calories 340. Calories from Fat 110. Contains: Gluten, Soy, Dairy. Nostalgic, classic sloppy joe ingredients&hellip; on a pizza. Mozzarella cheese, our handmade sloppy joe tomato sauce, ground beef, and diced peppers.